I think it was the hype surrounding this book that made me a little cautious when reading it. I don't know what it was exactly that I was expecting because I had only heard the basics. It is about a girl called Celaena who is an assassin. I was surprised (though I shouldn't have been) that I loved it so much. I wasn't expecting the magical elements which are subtle and effective, nor was I expecting the competition element to the plot which I also loved. I am glad that this is going to be a seven book series because I want to spend as much time with these characters as I can. The basic plot follows an eighteen year old girl called Celaena who is the most notorious assassin there is. Before this book takes place she was betrayed and captured and sent to work in the salt mines where most die. After a year there she is taken out by the Captain of the Guard, Chaol and the Crown Prince Dorian and given the option to fight for her freedom in the King's competition as Dorian's champion. 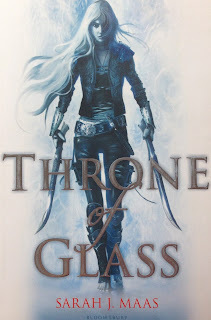 Celaena must pass tests and fight in order to gain her freedom but when other champions start being brutally murdered things start to get really interesting. There was definitely more to this book plot-wise than I was expecting. I also loved the characters. I don't know if there was a single one that I had issues with. They worked very well together and the dialogue was witty and funny. I gave this book 5 stars. I am excited to continue on with this series- which I already have, I just started Crown of Midnight which is the second book. Excitement much? ?